For English 101 you will use MLA (Modern Language Association) citation style. MLA requires you to note in the text of your paper every time you borrow information from a source, whether you quote, paraphrase, or summarize. In-text citations are brief and are used in conjunction with a Works Cited list with more complete information about your sources. The MLA Handbook, 8th edition, is the ultimate guide for using this citation style. The St. Martin's Handbook and credible online resources for using MLA citations are all based on the MLA Handbook. The library has two copies; ask for them at the Library Services desk. Some databases offer help in generating formatted citations. In EBSCO databases look for this feature in the Tools menu. Caution! While this feature may save time, it usually does not generate error-free citations. You need to check the citations carefully using the MLA Handbook or another reputable source based on the MLA Handbook. 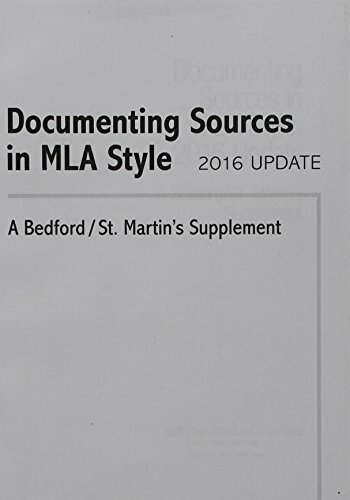 Outlines changes in the MLA citation style with the 8th edition of the MLA Handbook, published in April of 2016. From the Purdue University Online Writing Lab (OWL). There are several online "engines" where you can enter information about your source and generate a citation. Caution! While these tools may save time, they usually do not generate error-free citations. You need to check the citations carefully using the MLA Handbook or another reputable source based on the MLA Handbook. Consult this guide for more information on MLA formatting. Ask for the 8th edition of The St. Martin's Handbook at the Library Services Desk. Use the update below for up-to-date MLA citation information.